April 22, 2013 September 8, 2015 / Javan H.
April 20th was scheduled to be a big day for me. It was to mark the third launch of my Space Shuttle series (full website here), and it was also to mark the beginning of my Summer tour of Baton Rouge. I can now say that it held true. While I was out, I thought about everything I wanted to do around town this Summer, and with my interest in blogging, I’ve decided to document it all. I’m calling it “Javan Does Baton Rouge.” I plan to go to local hangouts, restaurants and new venues, and give my take and recommendations based on the experiences. As a Katrina victim from New Orleans, I’ve recently come to realize that while Baton Rouge is still a mid-sized business city, BR is pretty dynamic at its core. More than just a college city, the many different cultures found within Louisiana converge here in the Capital Area, which has also become more and more enticing to young professionals. All in all, I have many places lined up, including some to which I visit regularly. It’ll all be here, so let’s begin. This is an observatory in Highland Road Park in the Southern part of Baton Rouge near the East Baton Rouge and Ascension Parish line. 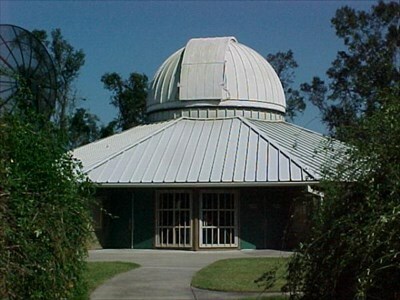 Established by The Recreation and Park Commission for the Parish of East Baton Rouge (BREC), LSU’s Department of Physics and Astronomy and the Baton Rouge Astronomical Society (BRAS) in 1997, the Highland Road Park Observatory, or HRPO, is home to two telescopes and an open field nestled within the trees across Highland Road from the main park. The site is home to local volunteers and consultants lending their expertise and studies in the field of astronomy to those who visit. The volunteers and visitors also conduct research on asteroids, having discovered dozens. One was even named after the city of Baton Rouge! HRPO hosts free weekly events including the Friday Night Lecture series, a seminar sharing new and developing finds in astronomy, and the Evening Sky Viewing, which lets guests observe the planets, stars and other celestial objects through the stationary 20- and 16-inch telescopes, weather permitting, as well as smaller telescopes placed around the perimeter of the main building. HRPO also has a large sundial in concrete on the back of the main building. Home to the large 20-inch telescope upstairs, the indoor area is decked out with astronomy-related equipment, facts about spacecraft, planets, satellites and more, as well as space-related merchandise at the front desk. Many volunteers are on hand and if you’re a space geek like I am, it won’t be hard to strike up lengthy conversations with them, speaking of Orion as if he’s Johnny Depp. In addition to seminars and children’s camps, HRPO hosts gatherings around certain astronomical events as well, including the 2012 transit of Venus across the Sun. But my personal staple at the research venue is the yearly International Astronomy Day. I’ve been deeply interested in astronomy and a devout follower of the defunct Space Shuttle program ever since I was a little kid in the mid-1990s. With that in mind, an ad for the International Astronomy Day, or IAD, last year at my job brought my attention here. IAD is an evening-long event beginning around 3:00pm locally with food, music, cake, and locally- and space-related games, rides and activities for kids who are also in attendance. Scheduled viewings from the stationary telescopes allow visitors to observe the craters of the moon in a way that no high-resolution picture can depict. Looking through the telescopes, I felt like I was literally hovering in front of the moon because the sharp shadows of the lunar terrain rivaled those of the Grand Canyon! Smaller, lower-powered telescopes, some belonging to the BRAS members themselves, are also laid out and are strategically placed and manipulated over time to give you the best views of nearby planets as possible. I got the chance to see both Jupiter (between inside the horns of Taurus) and Saturn (near Virgo‘s legs) in mind-blowing clarity. A view from inside the building view NASA TV during the transit of Venus. An adornment and live feed from a telescope during the transit of Venus. Special sunglasses were shared among the visitors allowing us to look directly at the Sun as Venus passed. A close-up of the live feed from a telescope during the transit of Venus. The largest of the outer “gas giants,” as well as our solar system of eight planets in general, Jupiter appeared as a bright white dot and you were able to see those famous rust-colored bands that wrap around Zeus’ planet. I was also able to see some of the many moons that surround it, all of which looked like pixie dust from the Disney movies. Having viewed it twice, I had a feast when it came to Saturn. Though you can’t expect the same saturation of color that you get with the NASA photos, even those don’t do the planet justice. The least dense of our planets, Saturn also appeared completely white due to the Sun shining on it, but to be able to see those thick and massive rings of which the planet is known for was absolutely stunning. I arrived there at 9:00 so that I can do a little bit of stargazing. With an astronomy book in tow, I wanted to map out the many large and dim constellations that own the night between the Winter and Spring. After over a year, I was able to make out all of Ursa Major, the big polar bear that houses the asterism “The Big Dipper,” as well as the top half the very massive and dim virgin, Virgo, as she scoured Baton Rouge for wheat. The emcee of the night sky at this time of year is Leo, the lion, which I used as a key to locate many other constellations, both familiar and unfamiliar. I was also able to see nearly all of the almost invisible constellation of Cancer the Crab, of which my zodiac sign is named after. After my neck got tired from all of the stargazing, I began to float around in the main building and among the three available telescopes outside. It was at this particular time that I met Mr. Boeker, a volunteer. Initially using his telescope to view Jupiter, he and a visitor repositioned the equipment to view Saturn, which was on the eastern side of the field, just above the treeline. He allowed me to carefully hold his viewfinders as he swapped them out for higher magnifications. Like with anything, the higher the magnification, the more noticeable the vibrations, but all of us who saw through his lenses saw something that was more than just a Kodak moment, so I want to give a massive amount of gratitude to Mr. Boeker for his time and resources. Though the schedule is subject to change, you can also look forward to broadcasts of NASA TV inside, as with the Transit of Venus, and also a short stargazing lecture on the sundial. For IAD 2012, the theme was “2012 Science, 1812 Sky” in light of Louisiana’s bicentennial and the amount of city light that pollutes the air. Erin, another volunteer, hosted “The Light of Leo,” an event in which she purposely gave a ten- or fifteen-minute lecture so that the visitors’ eyes would get acclimated to the sky. As the time passed, more and more stars became visible and she proceeded with the tour of the sky, showing us the fast-moving International Space Station and another satellite, as well as Mars beneath Leo, and Saturn, then still in Virgo. She also taught us the star-hunting device “follow the arc [of the Big Dipper] to Arcturus [the bright foot of Bootes the farmer] and speed to Spica [vivid the bundle of wheat in Virgo’s left hand].” But then Erin followed it up with “see Saturn” as the planet and the star were very close to each other. All in all, I’ve always left the Highland Road Park Observatory with a lot of knowledge, feeling great about the time I spent there. Whether you want to enroll your kids in an astronomy camp, or of you’re thinking of joining BRAS and gettin’ your astronomy ‘thang’ on, one visit will leave you, your guests, your brain, your eyes and even your soul happy. The HRPO website is http://www.bro.lsu.edu/ and it gives you detailed information on the history of the facility, a schedule of events, news, directions and a bevy of other important things. Go once, and you won’t regret it. That’s all for my first entry of this new blog series and I hope that you’ll continue to follow me and my work here, as well as on Twitter, YouTube and Soundcloud. Toodaloo! Pingback: Javan Does Baton Rouge — Red Beans @ The Roux House | Javan H.
Pingback: Total Lunar Eclipse in Baton Rouge | Javan H.
Pingback: Dream Log: 4-27-14 — Fight or Flight | Javan H.
Pingback: What Can YOU Do for BROWN? | Javan H.
Pingback: Why I Also Love Baton Rouge | Javan H.
Pingback: “The Bold and the Beautiful” — Skyfall. Sky…FALL. | Javan H.